The Puma Suede Classic Mid is available at an affordable price point. This shoe has been commended for its comfortable fit. Many buyers praised the fashionable look of the Suede Classic Mid. Some even shared that they received compliments from friends. A couple of users liked the sufficient ankle support of this sneaker. Few buyers praised the high-quality materials used. Many buyers revealed that they would recommend this shoe to their friends. This shoe has good ground traction for several reviewers. Several purchasers have commended the lightness of this kick. Many buyers liked the notable colorways available on the market. One user complained that the appearance of the shoe is different in actual compared to its online photos. Few users griped about the tad narrow width of the Puma Suede Classic Mid. The Puma Suede Classic has been on the market since the 60s and the iconic model is still well and alive to this day. Puma kicked its classic silhouette up a notch with a mid-top height for a sportier look and threw in a definite hint of street swagger. While a few suffered from the Puma Suede Classic Mid’s width issue, this shoe is still commendable for its unmatched comfort, premium detailing, durability, and affordability. The Puma Suede has been named as one of the most in-demand shoe models in the arsenal of the Puma brand. It easily obtained its spot as an icon in the shoe industry because of its unique and stylish upper. The Suede was initially introduced in 1968 as trainers to substitute the accustomed leather and canvas footwear. This shoe faultlessly turned to a hit on the streets with its velvety suede upper and thick rubber sole. The hip-hop culture and breakdance circle quickly embraced this stylish kick. It was successful in reaching various generations and became the choice of footwear for creative individual types. This iconic silhouette was released in various Puma Suede iterations in the form of multiple collaborations with several artists, celebrities, and brands, as well as new engineered constructions. The Puma Suede Classic Mid is a lifestyle-sport footwear that displays a modernized classic silhouette. True to its precursor, this shoe also has a suede upper with a lace-up system that sits on top of a vulcanized rubber outsole. Puma upgraded the classic look without sacrificing comfort and durability. This mid-top Puma Suede Classic Mid displays a versatile and sporty style suitable for any casual ensemble. It was built to the exact specification of its OG version with tall collar height. This shoe showcases luxurious monochromatic suede upper with foil Puma Suede print on the side. Designed to be versatile, this shoe goes well shorts, jeans, skinnies, and activewear or any laidback get-up. Skating downtown, running outdoor or attending an unplanned casual event – the Puma Suede Classic Mid will almost always match one’s styling needs. 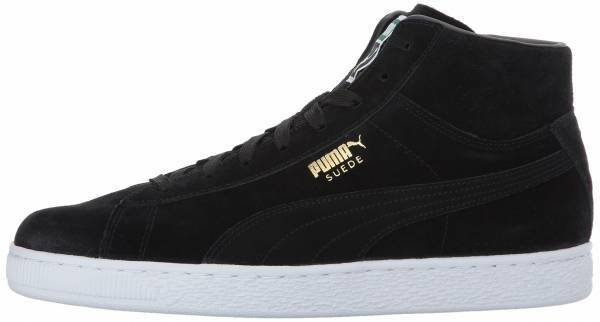 The Puma Suede Classic Mid is available in men’s sizes 5 to 15 US in medium width. This pair runs true to size, yet some reviewers found this pair tad narrow; therefore, some suggest purchasing half size up for a more comfortable fit. This shoe has a custom fit lacing for a secured fit. The mid-top height of the Puma Suede Classic Mid gives this shoe a striking feature over its OG ancestor. Aside from it enhances the sporty and casual vibe, the mid-top profile delivers better ankle support and protection. The Puma Formstrip is made of terrycloth. It has the Puma Suede foil typescript on the sides. It displays the Puma logo label on the tongue and Cat logo at the heel. The rubber outsole provides superb grip. It contains cushioned footbed and smooth synthetic lining for added comfort. This shoe has padded collar and tongue for enhanced comfort. This product weighs 14 oz.